Most of you will be aware of the developments within the Mangawhai Activity Zone. New equipment for the children’s play area has been well received and the activity zone has become the social hot spot. You will often find thriving activity, as each of the zones tempts kids of all ages to challenge themselves. MAZ has worked closely with Project Crimson to establish the 3 hectare area. 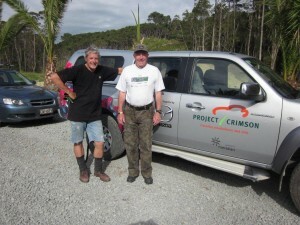 Gordon Hosking pictured with MAZ committee member Warren Stott have been instrumental in the planning and development of the bike and walking trails to ensure that these areas of the park are sympathetic to the environment. Signage has been erected at the park to remind visitor’s that a social responsibility needs to be upheld by every individual. The signs serve as a reminder that it can be a hazardous area and that safety must come first. The skate bowls have proven to be an absolute success story. The youth fully respect the facility and they are constantly in use. Big plans are still on the drawing board for MAZ’s ongoing development. We are auctioning off a brand new home on 25th February 2012, @ 2pm. We are hoping to raise enough funds to continue with stage two of the skate park area. This auction date is one to put in your diaries as it promises to be a fun filled family day with entertainment for everyone. So bring your picnic blanket and charitable spirit, and enjoy the journey. This entry was posted on Monday, January 23rd, 2012 at 12:07 am. It is filed under News, Park Progress. You can follow any responses to this entry through the RSS 2.0 feed.